Research America designs marketing research telephone interview studies for both private sector businesses and public organizations. Our consultants deliver continuous and ad hoc projects for any organization. Computer Assisted Telephone Interviewing (CATI) is primarily a quantitative data collection method, which uses a blend of live telephone interview and optional Interactive Voice Response (IVR) survey interviews to rapidly collect information from your targeted sample. CATI surveys often contain one or two open-ended questions asked by a live interviewer. Software systems immediately process results and perform initial analysis. Quota control is built-in to our systems: software actively tracks progress without the time lag which often occurs when interviews occur in the field. Telephone In-Depth Interviewing (Telephone IDI) involves qualitative research. A trained in-depth interviewer conducts an interview over the phone with a targeted respondent, using a topic guide instead of a structured questionnaire. Telephone IDIs enable Research America’s interviewing team to reach more respondents than on-site or live face- to -face interviews allow logistically. Each type of marketing research interview has its benefits and drawbacks. CATI is fast, but impersonal. Telephone IDIs can reach more respondents across wider regions, but interviewers are unable to observe, respond to and report on respondents’ body language and other nonverbal cues which are helpful during an IDI. In any type of telephone interview, it’s harder to develop rapport with the respondent, which is helpful when study topic involves sensitive, or very personal questions. Our telephone interviewers are skilled communicators who have been trained to build rapport with both business and consumer respondents. Interviewers understand how to apply bias-free probing techniques to clarify responses which may be unclear, without leading the respondent in one direction or another. Our skills extend to interviewing in languages other than English: many of our interviewers are fluent speakers of English and another language (including Spanish), and we can hire and train to specifications in our interviewing rooms throughout the United States. We connect with your market audience and conduct telephone interviews as far as your organization’s reach. Our staff can call consumers anywhere in the United States or abroad in Latin America and the Caribbean, South America, Asia and the Pacific, Australia, and Europe. We are available 24-hours a day to accommodate global business. Research America consultants will design a telephone interview study with your input. We’ll test your study, create and train your interviewing team, and rapidly progress through contact lists to conduct your series of telephone interviews. 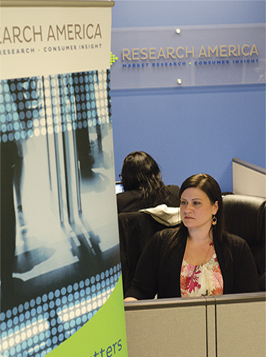 Research America analyzes data in-house. Online reporting dashboards allow you to view immediate survey results, and our consultants and analysts provide executive summary and other styles of formal presentation and reporting. Our consultant team will guide you through making research decisions, deciding on your topics and helping you choose which types of marketing research methodologies will accomplish your goals. The information that Research America provides for you through telephone interviewing will help you move forward with your marketing plans, knowing more about the audience for your products and services, and understanding how to interest them in your offer.